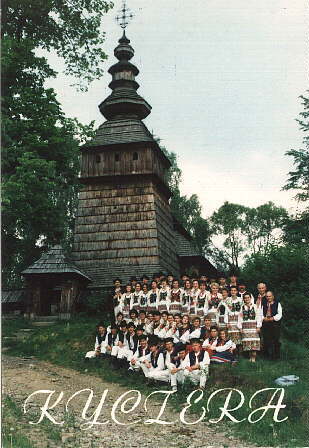 Founded 1991 in Legnica, southwest Poland (a center of the Lemko Rusyn diaspora in Poland); founder and director: Jurij Stazhynskij; chiefly youth membership; has performed in concert and at festivals in Poland, France, Slovakia, Ukraine, Germany, Spain, Portugal; propagates Lemko Rusyn dances and folk songs. NEW photos added June 25th! 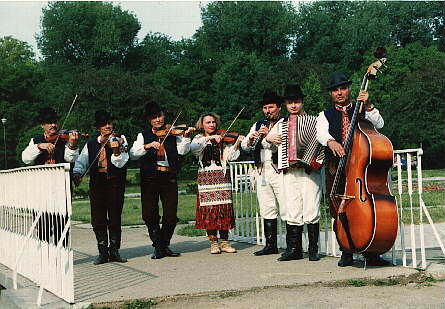 Kyczera is a Lemko ensemble from Legnica (Poland). It was founded in 1991 by Jerzy Starzyñski, who has been also the ensemble's artistic director and leading force. The members of the groups are young Lemkos from the Lower Silesia (southern and western region of Poland), whose families were forcibly resettled there from their Carpathian homeland during the infamous "Akcja Wis³a" (1947). The ensemble numbers 60 people, who belong to three sections: singers, dancers and musicians. 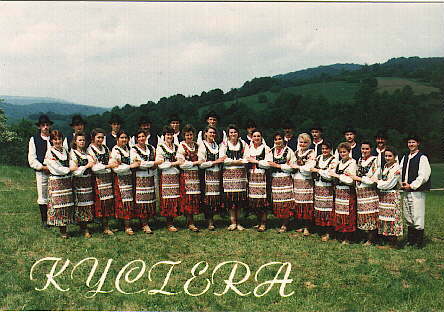 In its repertoire, Kyczera has a number of traditional Lemko dances like: sijer, dyrda, potrjasanyj, madiar, obertan, para za parom, kolechko, vstekla pol'ka. It also performs Lemko ritual customs, for example: excerpts from a traditional Lemko wedding or folk dancing party at the tavern. All the members of the ensemble wear during concerts traditional Lemko costumes. Kyczera has already given many concerts in Poland and toured: Germany, France, Spain, Portugal, Austria, Italy, Slovakia, and Ukraine. The ensemble is the winner of prestigious prizes, among others the prize of the Minister of Culture of Ukraine and the Oskar Kolberg Prize, the single most valuable Polish prize for folk ensembles. Kyczera is the only ensemble which was twice among the laureates of the Ukrainian Festival in Poland. Its popularity was strengthened by recordings done for the Polish TV and Radio. Along with the artistic activity, the ensemble is recording old Lemko songs, dances, customs, rites. The members of the ensemble also collect materials on the history of the Lemko villages in the Carpathians as well as on the history of the forcible resettlement of Lemkos to the northern and western parts of Poland. Kyczera is a co-founder and a initiator of many artistic events. Its activity has given the way to the organizing of the biggest European folk festival of national and ethnic minorities. Festival "Europe Without Borders", which takes place in Legnica, gathers folk ensembles from Italy, France, Jugoslavia, Ukraine, Hungary, Slovakia, Czech Republic, and other countries. Right now Kyczera is about to establish a fully professional Regional Center of Lemko Culture in Legnica. The plans include: A Lemko club, a Lemko restaurant, a Lemko library and archive, as well as a small museum. The Center would serve as a place where Lemkos can cultivate their traditions and where others can learn about Lemkos. In order to realize this plan the ensemble is making efforts to pursue a building. The building that their have in mind has 25 rooms (6 of them measure 50 square meters) with the total of 600 square meters.